David Trone’s congressional campaign appears to be getting worse by the day. 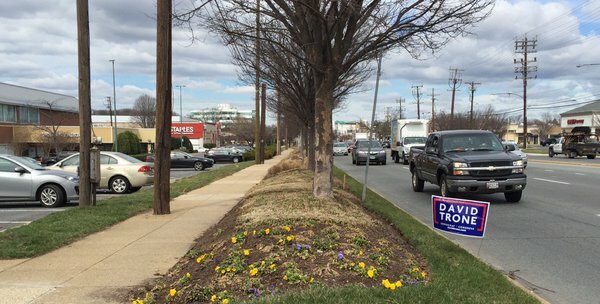 Vowing to spend whatever it takes to win a congressional seat in D.C.’s backyard, Trone’s campaign is doing whatever it takes to build its name recognition among voters, including placing signs illegally and without deference to the law. Last week, I wrote about Trone’s illegally placed campaign signs; the article I wrote can be found on A Miner Detail, here. That’s not exactly the operative response a candidate should give. Trone’s problem only gets worse. “Coming off I-70 Eastbound, I noticed a young women driving a gold Toyota Corolla illegally erecting David Trone for Congress signs up and down Route 75 & Route 144. I then proceeded to ask her who was telling her to place the signs illegally. The young woman responded again, “Uhh his name is Nathan Keltch. I was just hired yesterday from Craigslist, so I don’t know what I am doing. They just told me to place signs anywhere and everywhere.” The young lady then showed me an email via a craigslist posting showing Nathan Keltch’s name in the signature line. The ad pictured above is currently live on Craigslist. I contacted “Nat” (Nathan Keltch) via the phone number listed in the above Craigslist ad. Mr. Keltch cheerfully answered my call and greeted me with, “I’m very glad you called.” I introduced myself to Mr. Keltch by my first and last name and told him that I am a Maryland blogger at AMinerDetail.com. I asked Mr. Keltch if he had any comment as to whether he was directing paid campaign staffers to place signs, according to the young lady named above, “anywhere and everywhere” throughout the 8th Congressional District. Mr. Keltch said he had “no comment” and immediately terminated the call. I dialed Mr. Keltch’s number twice after he hung up on me. Both of my phone calls went to Mr. Keltch’s voicemail. 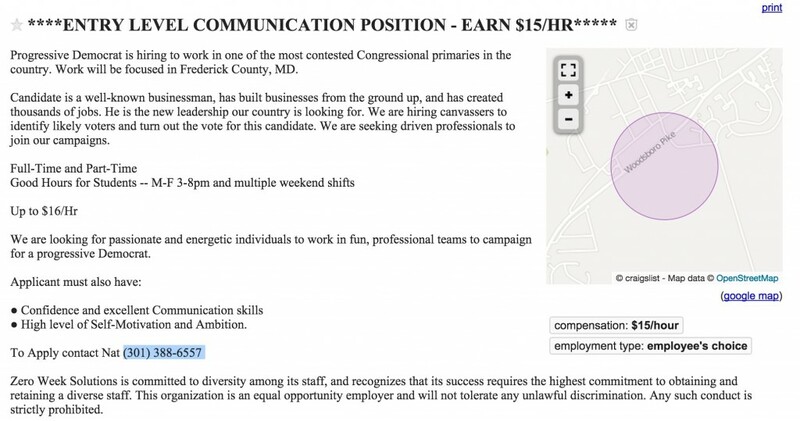 Last month, on February 17, I broke the story that David Trone’s campaign is hiring campaign staff from Craigslist. The Trone campaign hired a company named Zero Work Solutions, ostensibly for the purpose of hiring paid field staff (from Craigslist) to door knock and place campaign signs throughout the 8th Congressional District. 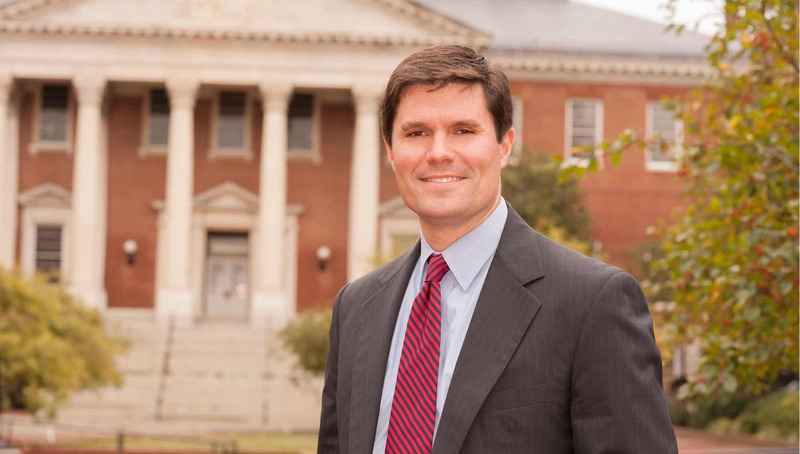 I have contacted Trone’s communications director multiple times for comment. I have yet to receive any response. My hope is that Trone’s campaign trains its “Canvass Director(s)” accordingly and instructs his entire staff to follow the laws dictating political sign placement. Now that Frick is out in CD-6, who stands to benefit?